Every year on December 27th, Ashley Santi surprises a random family by buying their child a birthday cake in honor of her late daughter’s birthday. According to Buzzfeed, Santi’s daughter McKenna died in a tragic accident at only nine months old, and Santi has been performing these random acts of kindness ever since as a way to transform her grief into a positive action. Santi revealed that she goes to a local bakery on the day of her daughter’s birthday and surprises someone by paying for their cake. Santi’s annual tradition went viral when Kyle Jauregui went to pick up his little sister’s birthday cake and was surprised to find that it had been paid for. “So today is my sisters birthday and when we went to pick up her cake someone had already paid for it. It was left with this card… my family was speechless and we just want to say thank you to McKenna’s mom and wish McKenna a Happy Birthday. There’s still good in this world,” Jauregui tweeted about his sister’s birthday cake gift. 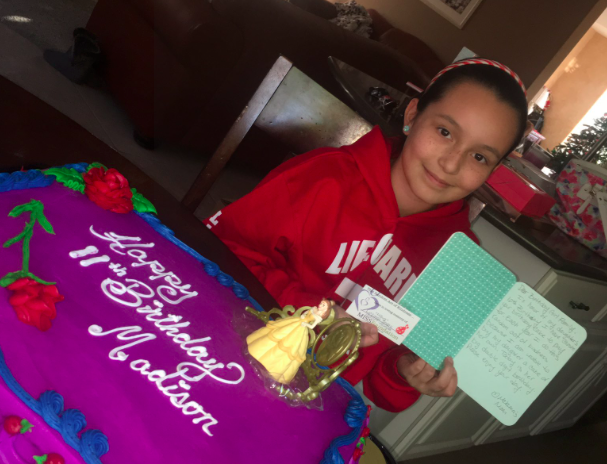 Santi says she was inspired to start the annual cake gifting after joining the MISS Foundation, an organization that supports families who have lost a child at any age from any cause. Part of the program encourages grieving parents to take part in the random acts of kindness campaign to spread joy while remembering their loved ones.